2016 marks the 150th anniversary of Kuroda Seiki’s birth. 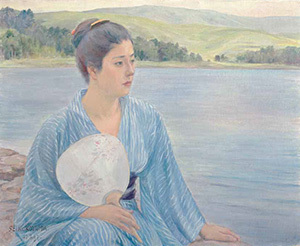 Widely known for his painting entitled Lakeside, Kuroda (1866–1924) contributed greatly to the modernization of the arts in Japan. This exhibition aims to comprehensively look at Kuroda’s artistic achievements through his masterpieces. 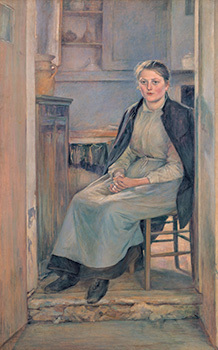 These include Reading and Portrait of a Woman (Kitchen), which were painted while he was studying abroad, as well as those from after his return to Japan, such as Maiko Girl and Wisdom, Impression, Sentiment. 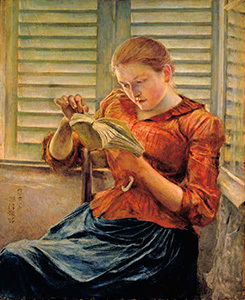 The exhibition also features works that Kuroda could have seen in France and was influenced by, including ones by Raphaël Collin (1850–1916), under whom Kuroda trained, and Jean-François Millet (1814–1875). Kuroda Seiki (1866–1924) was born in Kagoshima as the son of a samurai from the Satsuma Domain. He moved to France to study law when he was 18. 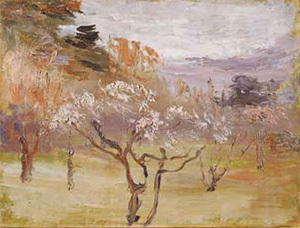 He met several Japanese painters while in Paris and their exchanges stiffened his resolve to become a painter himself. He entered the studio of Louis-Joseph-Raphaël Collin (1850–1916), a French artist who faithfully followed academic art principles while incorporating a bright plein air style of expression into his works. This further whetted Kuroda’s aspirations to be a painter. Kuroda’s paintings from this period reveal an artist learning based on the Academic art education in France and developing his own style. During his stay in Europe, Kuroda visited and fell in love with the village Grez-sur-Loing. It was here that he met Maria Billaut. 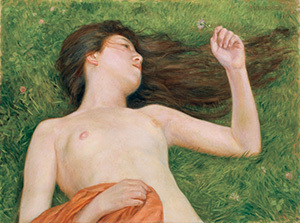 She served as a model for the works that would come to epitomize his time in France. 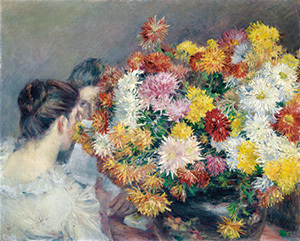 Kuroda’s natural artistic talent was recognized by the French art world when his painting Reading was accepted at the Salon of Société des Artistes Français exhibition in 1891. Kuroda took his first steps as a painter during his student years and his paintings from this time are awash with the brilliant light of Europe. 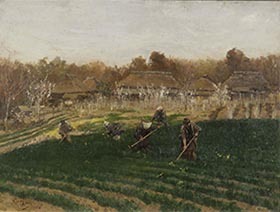 Kuroda also felt an affinity with artists who painted scenes of rural life. 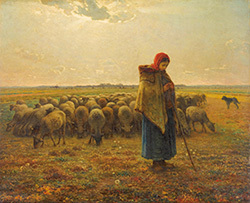 These included Jean-François Millet (1814–75), who belonged to the Barbizon school, and Jules Bastien-Lepage (1848–84), a painter associated with the naturalism movement. While in Paris, he also encountered works by Impressionist painters like Claude Monet (1840–1926) and he experimented with these forms of expression in paintings he created after returning to Japan. As well as studying academic painting under Raphaël Collin, Kuroda also developed his own deep interest in the themes, styles and ideas of modern French painting. 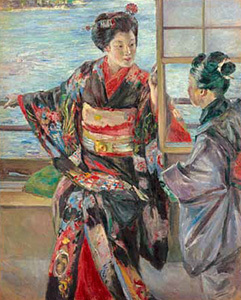 After returning to Japan in the summer of 1893, Kuroda searched for the ideal form for Japanese Western-style painting. His brightly-colored style breathed new life into the Japan’s Western painting scene. Soon after returning home, Kuroda set out to produce works in Japan that would bear comparison with French paintings. He strived to get Japanese Western-style paintings recognized internationally as true works of art. Traces of these strivings can be seen in the masterwork Talk on Ancient Romance (1898; lost in a fire), his attempt to paint a French Salon-style painting with Japanese themes and motifs. 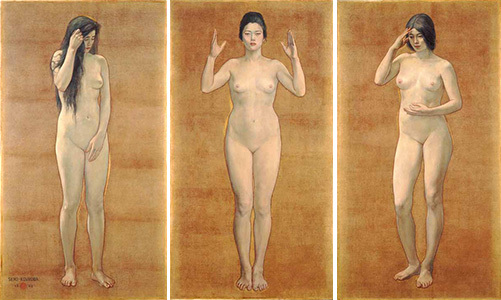 They are also on display in Wisdom, Impression, Sentiment (Important Cultural Property), his triptych painting portraying an idealized form of Japanese femininity. Lakeside (Important Cultural Property) was also painting during this phase of experimentation. Kuroda struggled to establish a form of academism rooted in Japanese soil. He believed this was vital for the future of Japanese Western-style painting. Kuroda’s numerous responsibilities led him to focus on the creation of smaller works during his later years. Influenced by new artistic movements like Post-Impressionism and Expressionism, these were not meant for public display. In these small works, we can see signs of an internal struggle as Kuroda tasked himself with the formation of academism while also sensing an affinity with new forms of expression. * Advance tickets will be on sale at the museum ticket booths (during museum opening hours excluding the last 30 minutes) and other major ticketing agencies from January 23 to March 22, 2016. * Special exhibition Hidden Treasures from the National Museum, Kabul (Tuesday, April 12 - Sunday, June 19, 2016, Hyokeikan) requires a separate admission fee. Organizers Tokyo National Museum, Tokyo Research Institute for Cultural Properties, The Asahi Shimbun, NHK, NHK Promotions Inc.
With the Sponsorship of Dai Nippon Printing Co.,Ltd.